A Tory council has refused to display a commemorative statue of the philosopher and revolutionary Karl Marx. The sculpture was gifted to Gloucester by the German town of Trier, Marx’s birth place, which is twinned with the English city. The statue of Marx has ended up in a back garden where it is currently functioning as a radically left-wing gnome. 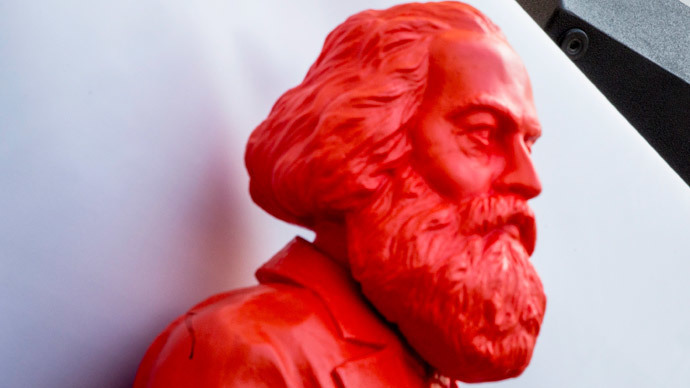 Four feet high and made of bright red plastic, the statue was one of a batch of five hundred produced in Trier, west Germany, and originally gifted with the intention of marking Marx's 195th birthday. Local resident Chris Yates is part of Gloslink, the cultural liaison organization which deals with ongoing relations between the two towns. Born in 1818, Marx settled in the UK after being ejected from France for his dissident activities. He died in March 1883 and was buried in Highgate Cemetery in North London. Visiting the father of communism’s grave costs adults £4, arguably lending some ironic weight to the arguments he made during his lifetime. It is unclear whether the arrival of Marx in the Gloucestershire garden has influenced the revolutionary consciousness of Mr Yates’ other garden gnomes.